Today, on Twitter, I learned something new and interesting from environmental reporter Paul Voosen. Over the years, I've run into reports (like this one from the Union of Concerned Scientists) showing that genetically modified crops — i.e. Roundup Ready corn and soybeans, which is really the stuff we're talking about most of the time in these situations — don't increase intrinsic yields of those crops. But I've also seen decent-looking data that seemed to suggest exactly the opposite. So what gives? Turns out, this is largely an issue of terminology. "Intrinsic yield" means something very specific, and something different from what most of us think when we hear the word "yield". Because of this, both those sets of data that I've seen can be right, at the same time. 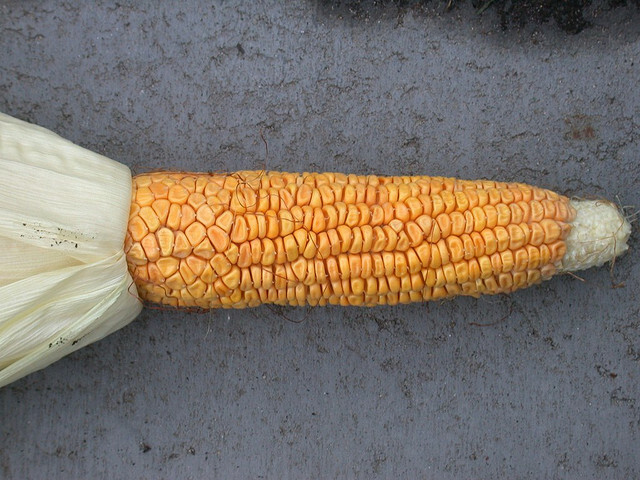 The UCS is correct that GMOs plants don't seem to produce higher intrinsic yields — that is, there aren't more kernels per cob. But the data that shows GMO plants can produce more than conventionally bred plants is also correct, because that's looking at a bigger picture of "yield" — one that takes into account the fact that it's easier to protect those plants against pests. Fewer pests = fewer lost plants = a higher bushel-per-acre yield. Even if the plants, themselves, aren't yielding more. Jon Foley, a scientist who is also the director of The University of Minnesota's Institute on the Environment agreed with this distinction between "yield" and "intrinsic yield". He also told me that the overall yield data on GM crops isn't as simple as "yes, it produces higher yields" or "no, it doesn't". For instance, he pointed to a paper published this February in Nature Biotechnology which shows that GM corn sometimes out-produces conventionally bred corn and sometimes under-produces in comparison. The key is in the environmental context. The years where GM corn was producing similar or lower yields than conventionally bred corn were average years, when it came to factors like the weather, disease, and pests. It was in bad years that you can see a significant, positive, difference for GM corn. When the situation was bad, GM corn had greater yields. I'm not really posting this information because of the GM thing — although I suspect that will get more people to pay attention. What I think is most interesting about this is that it handily illustrates something I've seen in a lot of different conflicts based around science. When you're getting conflicting information, one of the best ways to start figuring out who is right is to look at the language and the semantics. Often, everybody's right. They're just right in different ways. Unless you look closely, you won't see the difference.